Sweet Cheeks Adventures: Grabbing my Holiday Essentials at Dollar Tree! 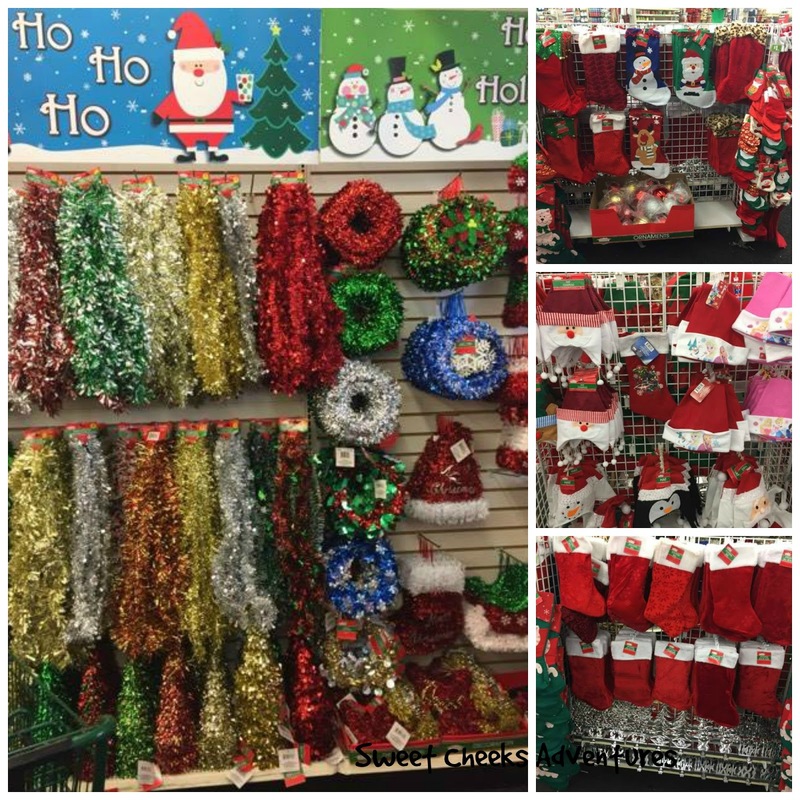 Grabbing my Holiday Essentials at Dollar Tree! A special thank you to Dollar Tree for sponsoring this post! I was compensated while doing this post, however all opinions and photos are my own. This post may contain affiliate links. Preparing for Christmas is one of the most stressful things during the latter months of the year. Of course this is no news to you. We are half way through November and I am happy to say that I am well ahead of the schedule! My Christmas Tree is up and I have been scoping out stocking stuffers. The inside of my house is all decorated with decorations I found at my local Dollar Tree! I love Dollar Tree for all of the essentials but also the products that take me back to my childhood. 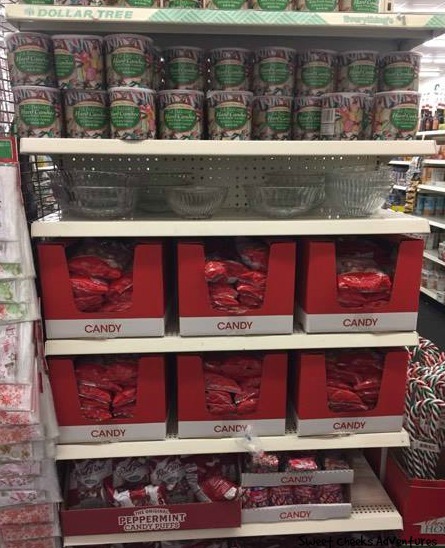 Every year my Grandma had a bowl of candy out at Christmas time. These candies were sweet, minty and perfect for a little girl's sweet tooth. The last couple of years I have been able to relive those memories with a can of these candies that I have found at Dollar Tree! What's even better is they have cute little dishes and candy holders for me to place that candy in! You see, I go to Dollar Tree for my decorations because just look at all the options! They have great ornaments, tree skirts, wall hangings, Wreathes and much more. I try to be crafty during the holidays too, so I picked up a few clear balls. Speaking of DIY ornaments, I am planning a Holiday Camp Out for Girl Scouts in a few weeks and we put in a large order on the Dollar Tree website for clear ornament balls. I had them shipped to the store for Free Shipping too! It was too easy and a great price to pass up! Those ornaments will be part of the reason why 150 little girls are so happy the first weekend in December! Above I mentioned above, I get my tree skirts every year at Dollar Tree. The product itself is good quality and they have cute patterns but the main reason I go there is my dog Danny. If you've been with us a while at Sweet Cheeks Adventures, you know that Danny is a large white dog that sheds like crazy! 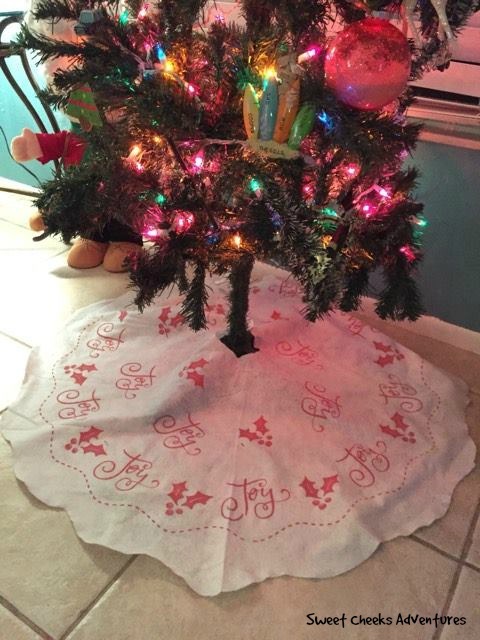 When I purchase my tree skirt at the Dollar Tree, it lasts all season and at the end of that season I can just throw it away. The dog hair has ruined it after its been out for 2 months. Every year I get a new one and I get to choose a different pattern if I choose! I could go on and on and keep your eyes and brain hostage but I'll end my opinions on Dollar Tree with this.. Stocking Stuffers! 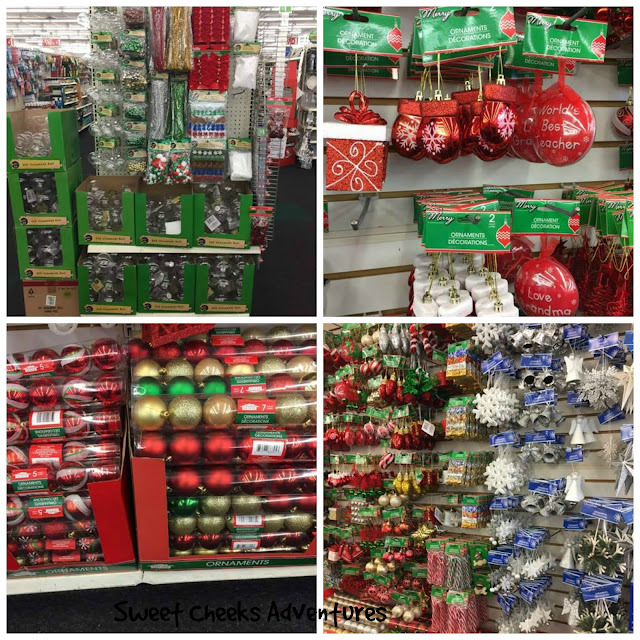 Whether you are looking for candy canes, peppermint goodies, chocolate covered marshmallow snowmen, or something with your favorite character, Dollar Tree really does have great options! Visit your local Dollar Tree to see the special goodies they have waiting for you. Hurry though! You don't want to miss out on all of the Holiday Cheer!